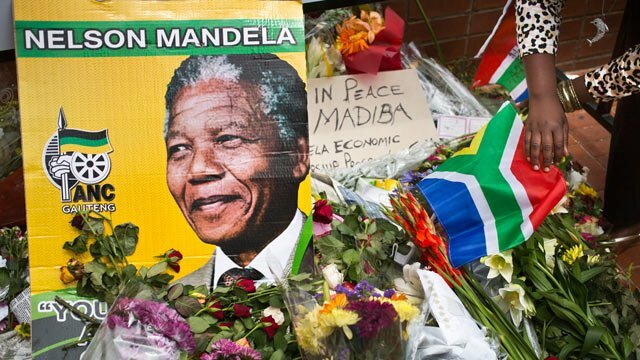 More than 60 international leaders have announced they will take part in the memorial service or state funeral of Nelson Mandela, South Africa says. Barack Obama, Francois Hollande and UK’s PM David Cameron will be among those attending Tuesday’s memorial at a Soweto stadium. South Africa’s first black president died on Thursday and the nation has held a day of prayer and reflection. Mourners in their millions visited places of worship and community halls. At Soweto’s Regina Mundi Catholic Church, a centre of the anti-apartheid struggle, the priest Sebastian Roussouw said the late leader had been “a light in the darkness”. Nelson Mandela’s ex-wife, Winnie Madikizela-Mandela, was among the congregation at the Bryanston Methodist church in Johannesburg, where President Jacob Zuma urged South Africans not to forget the values he had stood for. In Cape Town, Archbishop Thabo Makgoba said Nelson Mandela was a powerful and continuing reminder that individuals have the power to make change happen in the world. Over the next eight days, a series of events will commemorate the man who steered their country out of white-minority rule. Heads of state and government, global figures and celebrities will join 95,000 ordinary South Africans at the memorial service at FNB stadium in Soweto, where Nelson Mandela made his final major public appearance during the 2010 football World Cup. The event is likely to be one of the biggest such gatherings of international dignitaries in recent years. The government said 59 leaders had so far confirmed they would be attending: an indication of the special place Nelson Mandela held in people’s hearts across the world, officials say. Among those on the list are UN Secretary General Ban Ki-moon, German President Joachim Gauck, EU Commission President Jose Manuel Barroso, Dutch King Willem-Alexander and Crown Prince Felipe of Spain. Three former US presidents, George W. Bush, Bill Clinton and Jimmy Carter, will join President Barack Obama and First Lady Michelle Obama. Brazil’s President Dilma Rousseff, Palestinian President Mahmoud Abbas and India’s Pranab Mukherjee will also be there. Iran’s President Hassan Rouhani has not yet confirmed whether he will travel. Leading celebrities in the anti-apartheid movement Peter Gabriel and Bono are also expected to attend as are former international leaders such as Marti Ahtisaari who, along with Nelson Mandela, were part of a group known as The Elders, promoting peace and human rights. Nelson Mandela’s body will lie in state in Pretoria on the following three days and he will be given a state funeral on Sunday, 15 December. While Tuesday’s memorial service will clearly be a big organizational challenge, the state funeral will be a greater logistical one because of its rural remoteness.